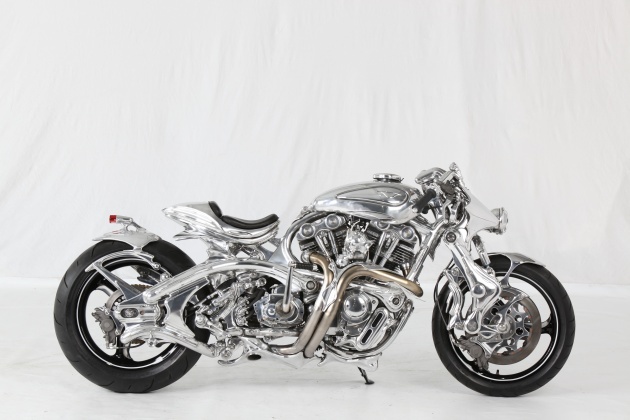 2011 World championship of custom bike building winner was Tavex 2011V made by Japanese shop Tavax Engineering, This is the one. A shop owner Ken Tabata said, starting point of his creativity was a letter from a great master of TOKUSATSU. He loved Godzilla when he was a kid and he wrote a letter to Eiji Tsuburaya and say "please give me Godzilla' figure". Later a boy got a replay from the giant and Tsuburaya said "don't wait somebody give it to you, you should make it by yourself", then Tabata made it by himself with friends'help and he kept correspondence with Tsuburaya until Tsuburaya died in 1970. Tabata gave up movie creater but he made his bike shop at 24 years old and now it has become world wide famouse shop. Nice story.